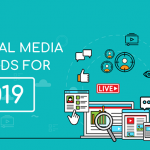 Since we are already in 2019, it’s time for you and your social media marketing company in Mumbai to evaluate the new social media marketing approach to help improve the marketing campaigns. Your goal should be challenging, but still reasonable to achieve. Reflecting on this component can reveal any potential barriers that you may need to overcome to realize success. Ensure you outline the steps you’re planning to take to achieve your goal before you go ahead with the marketing campaign. Regardless of what your vision and goals are, providing education is almost always the best way to help reach your audience. If your social media company in Mumbai is able to provide valuable information about your brand, product, industry etc – the audience will look to you as an authority and, in time, may become loyal customers. Producing the same content type endlessly will not only bore your audience but will also keep you away from reaching your goals. However, by varying your post, you ensure you engage with all target audiences on social media. Infact, this method also ensures more conversions against your goals. Videos are a lot better than any other type of content. It aids in building brand stories and encourages engagement and interaction. Moreover, when it comes to click-through rates, there’s no denying that video marketing sits comfortably at the top of the list. What type of audience are they interacting with? What type of hashtags are they using? Are they participating in social media events? Once you have this analysis in hand, you will be able to formulate a winning strategy for your brand. If you are looking for a social media company in Mumbai, to build up your brand, look no further than Spenta Digital Media. The team will review your current performance and set goals to improve it in the right direction that you want to move.